First of all, if it’s still 28 February 2013 and between 12 and 2 PM Eastern Standard Time, stop reading this and check out artist Bobby Frye as he streams some of his sprite work on Dungeonmans. It is an incredibly more rewarding experience than reading a dusty old development update. This week in Dungeonmans Development has been a whirlwind of bug fixing and business development, and not quite as much fun new features as I like. I’ve given myself monthly milestones and so the last week of the month is often a time to cross i’s, dot t’s, and generally clean up whatever messes I might have made while putting stuff together. I did manage to complete the layout and generation of Caves, which actually might be better off being called Tunnels given the design. They are build to connect two points in the overworld map, you enter one side and come out the other. A good deal of exploring a cave involves winding tunnels and larger caverns, with passageways that go in many different directions. There’s a main passage from one side to the other, but it isn’t always obvious which means there will be some wrong turns along the way. Fortunately for our hero, caverns that are otherwise dead ends usually contain a camp of monsters who are lairing or just hanging out, guarding a worthy pile of treasure. Exploration will be rewarding no matter what direction the player heads off in. What’s the big deal about two entrances? In the overworld, Mountains and Badlands provide a mazelike environment to explore, and sometimes a mountain range presents a barrier that the player is forced to go around. Caves help get around that, allow the player a shortcut to locations that might otherwise require long overworld journeys. Exploring is great fun, but it is also nice to be able to claim clear paths from one place to another when you have a destination in mind. Other than that, I spent some time clearing out old cruft from the codebase to make it easier to write area generation functions, fixed some annoying save game bugs, and did some work into making Dungeonmans scale to any resolution. I also received some absolutely wonderful environment art for the Graveyard, once that gets wrapped up I am totally putting together some new screenshots. Dev Update 07: Get Lost! 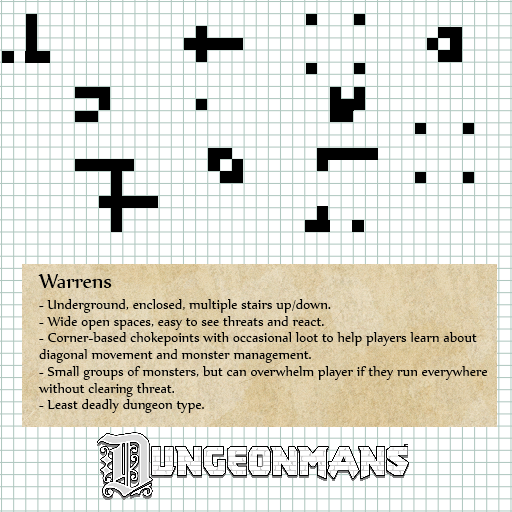 Work on dungeon layouts continues, and I’d like to show off some of the blueprints I’ve been working with to help keep the layouts unique and interesting. There’s a vast overworld to explore, but one of the development risks is that if areas are too similar, the game will begin to feel like a grind through a procedural wasteland. I don’t want to see that happen. * Keep areas varied and interesting. * Provide different levels of danger and challenge, separate from the strength of enemies. * Encourage players to adopt multiple strategies across their career. Things have been moving at great speed over the last couple of weeks, and unfortunately today I don’t have a great picture show for the updated. Graveyards and Ruins are relatively young, and the content is still temporary art. Found deep in forests, away from roads and friendly towns, Graveyards are a source of danger, treasure, and knowledge for the brave. Unlike the typical dungeon, the environment is open and enemies can come from everywhere. Gravestones and rusted iron fences can impede your path, but the clever Dungeonmans will use them to his advantage in keeping foes at bay and fighting on his terms. Even so, the ground is full of the unquiet dead, and it should be no surprise to see threats bursting up from the earth in an attempt to surround you. These graveyards also contain various ruins: old mausoleums and small temples that have cracked and fallen with age. Here, stronger groups of foes gather, ancient guardians and soldiers who never figured out that the fight was over. The cracked columns and old statues can provide solid cover for stick-and-move type harriers, or just be a pretty backdrop for armored titans who want to chew through enemies with a two handed weapon. 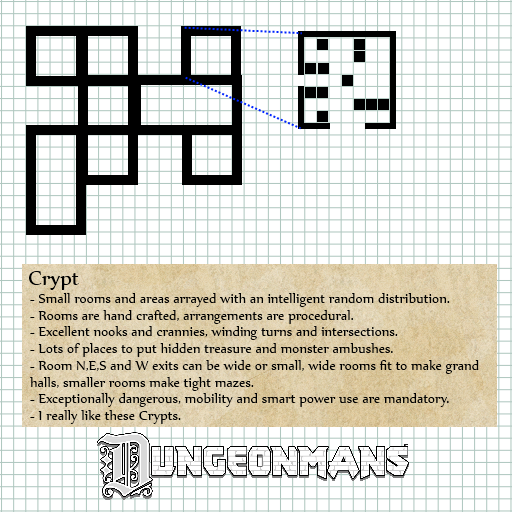 Careful searching of these graveyards will reveal generous treasure as well as the possibility of even greater danger: the old crypts underneath, sealed long ago but exposed in the fighting. More dungeons! * Graveyard areas that contain organized semi-random layouts of gravestones as well as other graveyard props. The idea is to present some degree of order, even though things are old and entropy has set in. * Graveyard areas allow for zombies to bust up through the ground from time to time. The player will have some warning about timing and position, and be allowed to react. 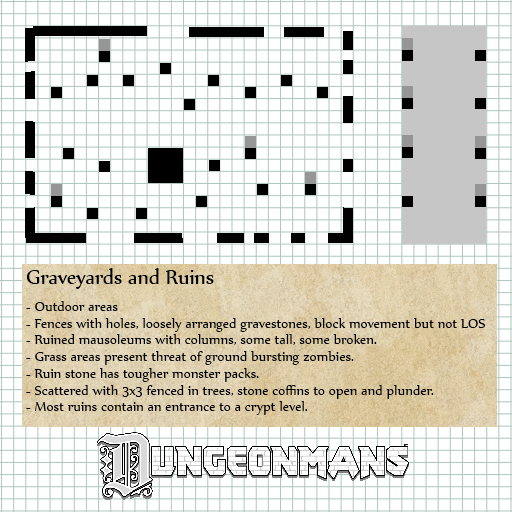 * Mausoleum / Ruin sections provide focused encounters with larger and more varied monster packs, though as long as the player stays on the stone they won’t have to worry about monsters breaking through the ground. * Arrange the graveyard generally so that the best rewards and strongest encounters are far enough from the entrance to feel meaningful. Word words words words I know. Eventually, pictures. Hopefully, over the course of development and iteration, I’ll hit that goal and make the Graveyard Ruin fights feel totally different from a regular dungeon crawl. We’ll see! UNTIL THEN why don’t you have an awesome time crushing monsters on your tiny handheld communications device? I am happy to shill for the excellent QuestLord, a dungeon crawl set in the old ways of first person exploration and combat. Grid based maps, a charming world, and tiny pixels doing great big things. QuestLord was built with the same independent fire and spirit that fuels Dungeonmans, except flames for QuestLord were powering someone who can actually make a good game. Seriously go look at it. As a knee-jerk reaction, when someone uses “balance” and “roguelike” in the same sentence, you get a hardy laugh and a funny look. Roguelikes are dangerous, deadly and unfair! Cheap instant kills, year long stuns, and deadly situations with arcane solutions you can’t possibly figure out without looking them up online. Come on. Well sure, those are the big points the genre might be known for, but when you look past the surface at some of the more polished roguelikes in the field, you’d be surprised what you find. * Will be won by the player if he fights using all the abilities of his new hero. * Can be, and usually are, won by the player if he uses simple melee. * Can be, and usually are, won by the player if he uses all the abilities of his new hero and positions himself correctly. * Will probably end in death for the player if he just auto-attacks without regard. Let’s focus on a many vs one fight. Here’s a situation in which a melee-based green rookie Dungeonmans is facing off against two Dungeon Crab-Rats. Two on one, the player will probably lose if just choses to stand still and beat them both down. He may have picked up a decent new weapon or might feel courageous with his Shield Bash, and the player is well within his rights to charge ahead– that’s the red path. However, a more cautious player might want to find a location where he can fight his foes one at a time. In most roguelikes, this involves standing in a doorway, but not all dungeons are going to have doorways! That means early areas should have choke points as part of the random generation as seen below. 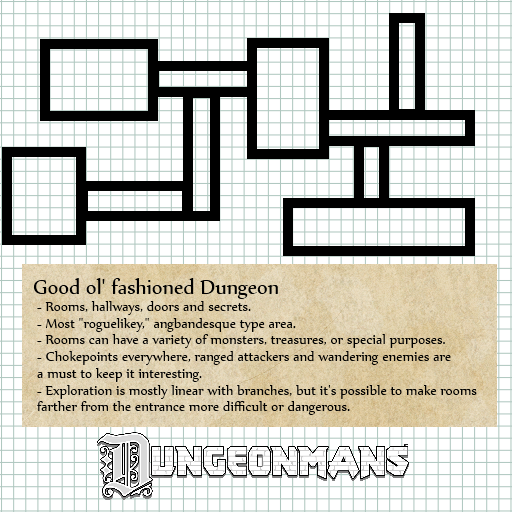 Since Dungeonmans lets you move in eight directions, stepping between those rock walls and into that space is easy to do. Once done, the player only has to face one rat at a time. The other one will likely run around the back to get him but that gives the player a few rounds to mop up the first one. 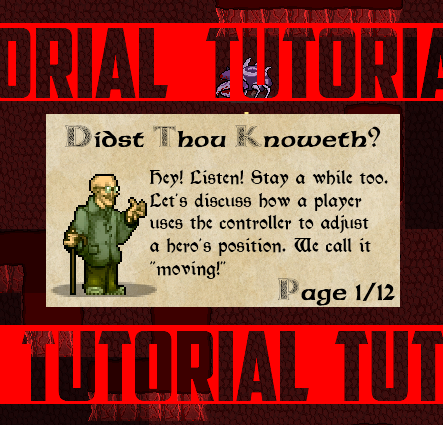 Of course a player new to roguelikes might not know they can move into a space like that. Admittedly, it’s not the most intuitive thing. How do we solve this? Easy– a clear, guided, hand-held tutorial on dungeon movement! Alright joke’s over. No that’s terrible, never do that. A much better idea is to nudge the player without telling him. Give him a reason to try moving into that space even before the monsters show up. Let’s use loot. 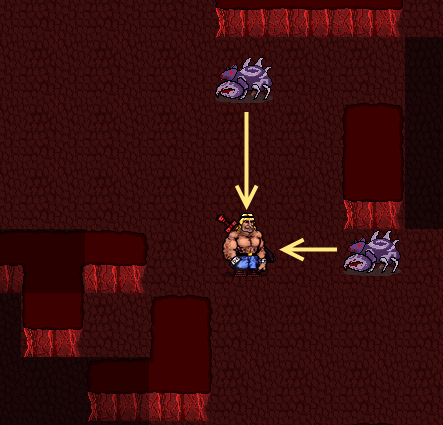 Crab-rats or not, when a player sees treasure, they generally want to go pick it up. They’ll try anything to get to a shiny something that appears just out of reach. In this case, it isn’t out of reach at all, but if someone sees this arrangement without realizing they can move diagonally into corners, they’ll discover through sheer force of greed. This means we have a new design rule for our earliest dungeon areas: Build a few chokepoints that have treasure inside them. Encourage the players to move into a position they might not have moved into otherwise, and they’ll learn without realizing it. That’ll do for now. Any thoughts on the update? 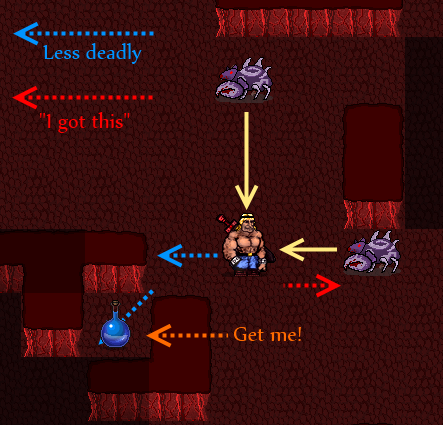 Other things you’d like to see more roguelikes try and teach? Please let me know in the comments below, or even via the Facebook or Greenlight pages!